What says Friday night more than pizza? This recipe definitely falls into the “semi-homemade” category. It makes such a great pizza though that I have to share it. Make it with low-fat cheese to keep it lighter. Be aware that it does have a lot of sodium in it though. 2) Meanwhile, grease pizza pan with olive oil (do NOT use the type of pizza pan that has the round holes in it). Prepare toppings. 3) Spread dough into pan. Top with sauce and use the back of a spoon to spread sauce across dough. Sprinkle on crushed red pepper. 4) Add cheese provided in the package and mozzarella cheese and remaining toppings. 5) Bake at 425 degrees for about 16 minutes or until cheese is bubbly and golden. Feeds two very hungry people or four people if you also serve a salad with it. The toppings I used are suggestions. Other great toppings are ground vegetarian burger, drained canned pineapple, green and black olives, spinach. 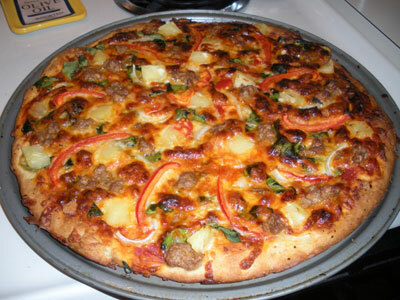 The pizza in the picture is topped with cheese, vegetarian sausage, pineapple, red pepper and spinach. Whatever you like and have on hand works! I make this pizza at least once every other week.